Best Business Letterhead Design Services in Zimbabwe! As much, business letterhead designs are just as vital in the promotion of the business. A business is also known as a company’s representative that carries the company name, a logo, address, contact numbers and other information that represents the company’s professionalism. Here at SPEMedia, we are very eager to provide your company with a chance to have the most incredible and professional business letterhead design that will most definitely stand out in the corporate market. Our best business letterhead design services are guaranteed to bring value-added corporate presence as well as enhance your brand’s credibility on several stages. What makes our services the most preferred is our capability to fulfill customers’ requirements of any standard. We have highly skilled graphic designers who work with industry set printing procedures according to the specifications of our clients. There are many letterhead design companies in the country but we consider ourselves the best. This is because we offer high-quality services at affordable rates. Fill out our contact form and one of our customer service representatives will get back to you as soon as possible. We have the ability to give your letterhead a marketing and advertising touch. This allows you to receive exposure as well as attention from customers. Not only that, we have the best rates as well as a great customer support service. Also, we give your business advice on how to get more from your marketing efforts. Like for example with minor graphics design edits your designed letterhead can be used on the design for your business stationery such as sales invoices, sales quotations, with compliments slips and delivery notes at no major extra cost to you! Can you help me with getting my letterhead designed in Zimbabwe? Yes, we can host your website today! Why not give us a call on +263 776 260 360 or email us to discuss your company’s letterhead design needs whether you are in Harare or anywhere in Zimbabwe. Get a free no obligation estimate or contact us to discuss your exact requirements. We appreciate that your business is unique in its own right. 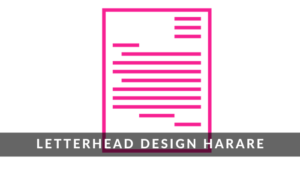 Therefore, we will design a personalised letterhead for you. Kindly fill the form below and we will reply you urgently with a custom price quote. We are open from Monday to Friday 8 am to 5 pm.